Homebuyers should be aware of some changes in the market over the coming year. Buying a home is a lifelong dream for many Americans, and it takes commitment and dedication to make it happen. With conditions in the housing market always changing, would-be homebuyers need to stay up to date on the key aspects involved in buying a home. Below, we'll look at several must-know items if you're looking to buy a home in 2017. The most important consideration for most of those looking to buy a home is how much they can afford to spend. Rock-bottom mortgage rates in recent years have made homes more affordable for ordinary Americans in many areas, but it now appears that those rates have hit bottom and are poised to rise. 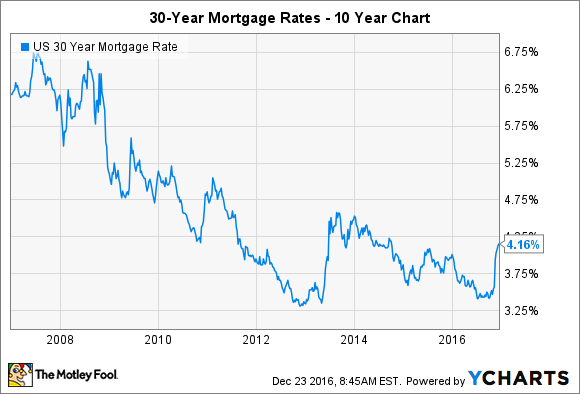 As you can see in the chart below, mortgage rates have climbed dramatically in just the last two months of 2016. U.S. 30-year mortgage rate data by YCharts. However, it's important to keep perspective. Even with mortgage rates approaching the 4.25% mark, homeowners are still benefiting from cheaper home financing than they've seen in the past half-century. It's true that rising rates will slightly reduce how expensive a home you can buy for any given monthly mortgage payment, but all in all, rates are favorable and will continue to be even if they keep climbing. One thing that has frustrated some policymakers is the fact that members of the millennial generation haven't been as quick to buy homes as past generations. However, that's looking to change, according to the National Association of Realtors, and with it could come a shift in the buying practices of entry-level first-time homebuyers. Traditionally, first-time homebuyers have struggled to afford even common starter homes like small houses or condominiums. That's still the case for many would-be millennial homebuyers, given the extent to which they struggle under student-loan debt that saps their ability to divert savings toward a down payment. However, some millennials have put off buying a home specifically in order to save enough for a sizable down payment that would potentially allow them to skip the starter-home dynamics and jump immediately into what in the past would have been considered a home into which they would only later move up. If that trend takes hold, then it could have an impact on pricing for starter and move-up properties, especially in local markets where pricing imbalances already exist. Lastly, one thing to keep in mind as you weigh the financial benefits of buying a home is that major tax reform initiatives are possible in 2017. The incoming Trump administration has already suggested dramatic changes to the tax system, and some of them will have impacts on homeowners. Specifically, the Trump tax plan dramatically increases the size of standard deductions. Although the president-elect's plan retains key tax breaks like deductibility of mortgage interest and real estate taxes, higher standard deductions can effectively cut the value of those deductions. If your deductible home expenses aren't enough to help your total itemized deductions exceed the standard deduction, then you don't really get any tax benefit from them. Moreover, some Republicans in Congress have proposed more dramatic changes to tax provisions that could eliminate the ability to deduct real estate taxes entirely. For most would-be homeowners, tax aspects of homeownership aren't the deciding factor in the purchase decision. Nevertheless, tax benefits can have enough of a financial impact to be important in the decision-making process, and those shopping for homes in 2017 need to be aware of the slippery ground in the tax law realm in the coming year. If you're looking to buy a home in 2017, be sure to keep these trends in mind. Real estate markets vary greatly across the country, but knowing where to look for opportunity can help you land the home of your dreams.